There was some serious swag at Dreamforce this year – from ballpoint pens and branded mints to smart cars and airline vouchers. But as I floated around the expo hall, snapping pictures and surrendering my badge to be scanned, I had to wonder: what makes a piece of swag truly great? And is it pronounced “swag” or “schwag”? Let’s start with the basics. To understand what makes great swag, you’ve got to understand why swag is an effective marketing tool in the first place. Swag can be easy to make – you put your name or logo on something, then you give it away. Whether you give your swag to potential customers, offer it to your employees as prizes, or leave it on a street corner, swag is an important part of lead generation and event marketing. First of all, even if a person has only a fast interaction with your swag – say, they glimpse an employee wearing a branded t-shirt at the gym, or they “accidentally” steal a branded pen from your lobby – you’re creating some level of brand familiarity. As behavior psychologists know well, familiarity is one of the most important factors in a customer’s buying decision. Familiarity causes cognitive ease – calm, relaxed feelings – and cognitive ease makes people feel comfortable spending their money. When you give people things, you tap into the human impulse to reciprocate. As Dr. Robert Cialdini writes in Influence: The Psychology of Persuasion, it doesn’t matter how big or small your gift is – when you give someone a gift, they want to give one back. This can be huge for your lead generation efforts. For example, at a conference like Dreamforce, people reciprocate by letting you scan their ID badge and collect their personal data (i.e. name, company, and contact info). 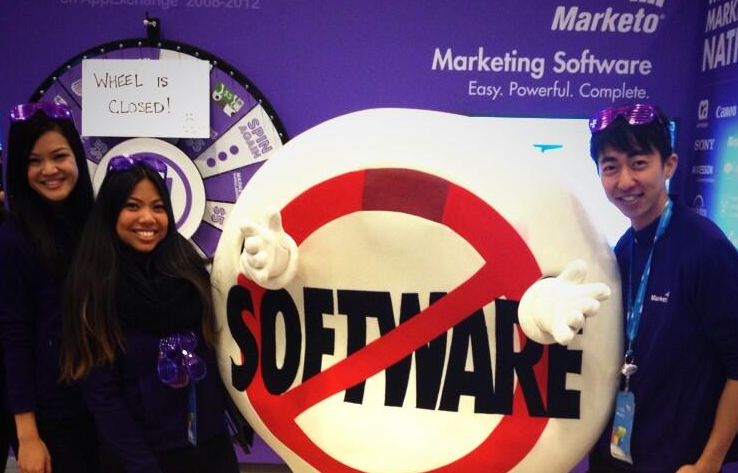 Since Dreamforce is a “noisy” conference with a ton of exhibitors, there were many other vendors that tried to bring that element of surprise to their booths. As an example, I was immediately drawn to the glowing pile of reusable ice cubes at Clarabridge’s table (shown below), which definitely stuck out. There are certain things no one can have too many of – water bottles, phone chargers, ear buds, reusable grocery bags, or even classic swag items like branded pens and breath mints. 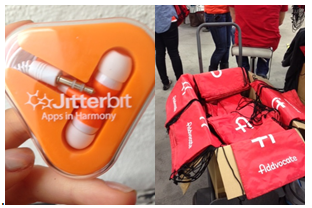 Other useful swag items came from Jitterbit, who brought ear buds, and Addvocate, who brought reusable bags. Like most people, I can never find my headphones or remember to bring a bag to the grocery store, so I was more than happy to trade a scan. These are your big ticket, big spending items. You probably won’t have budget to buy more than one, but they’re for generating leads and buzz. They are generally not great for giving each person something to walk away with. Make it contest – attendees trade a scan for the chance to win your big prize. Vehicles were a popular choice this year. 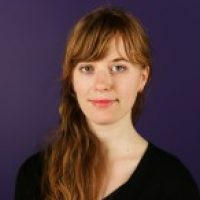 Attendees could enter to win a Tesla (from MuleSoft), a scooter (from Informatica), and a VW van (from TOA), among others. 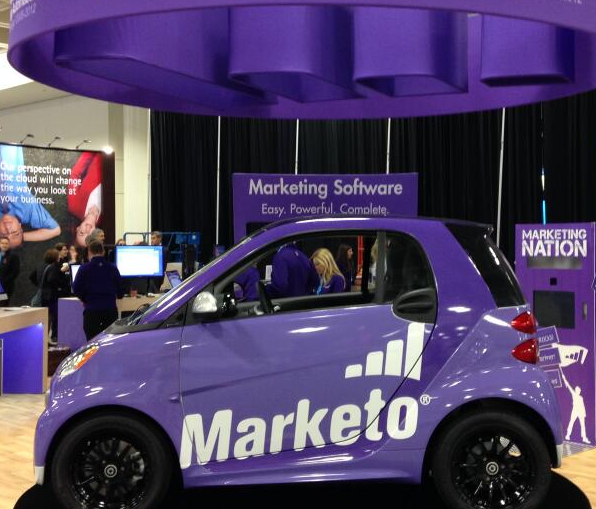 And Marketo also ran a contest to win a branded smart car, which drew attendees to our booth and generated us a ton of leads. Of course, you can’t go wrong with swag that is undeniably awesome. NTT Group gave out these tiny and adorable pieces of miniature food (I helped myself to a sushi and a donut), and Reliable Coders gave away robot toys and several touch controlled helicopters, which were zooming around the booth. 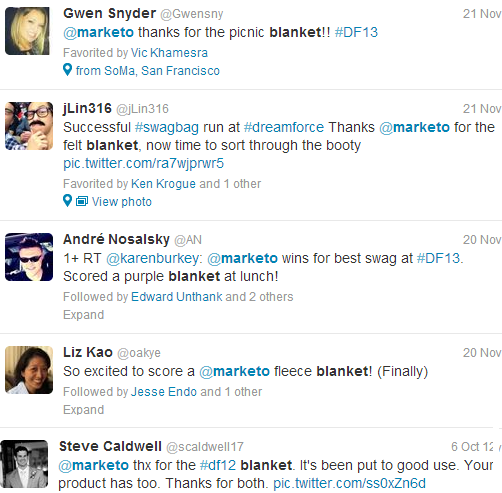 All of these pieces of swag performed their key functions – they increased brand awareness, they made themselves useful, they stood out, and they generated leads. 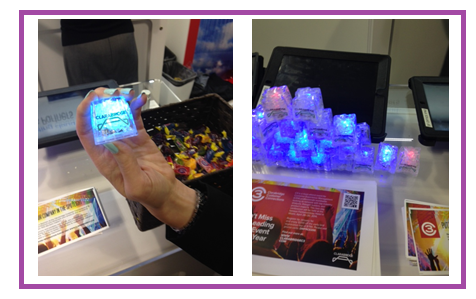 What’s your favorite promotional item you’ve ever been given, at a conference or elsewhere? What makes makes a good piece of swag great? Let us know what you think!